In the past 5 weeks or so, there have been quite a few news items about Nimble, with the biggest product news dated September 28 and the most interesting business development dated October 11. The headlines include Nimble’s deeper collaboration with Microsoft and its channel partners, as well as product innovations intended to increase the value delivered to Office 365- and G Suite users. · Now integrates with Circleback, an AI-powered contact capture and cleaning tool as well as their business card scanner. Nimble is now able to extract high quality contact information from email signatures and to add it to the Nimble contact record. This way it becomes easier to keep contact information current. · Has partnered with NeoCloud. NeoCloud is a managed cloud services company that deploys and manages Office 365. The company now bundles Nimble into all its Office 365 deals and thus offers business applications on top of its infrastructure- and productivity-focused solutions. This is based on the (valid) assumption that Office 365 users benefit from having a simple and powerful contact management platform that resides on top of the productivity suite. · Has become selected by Microsoft to join its Seattle Accelerator program. · On the product front released Nimble Prospector, a ‘powerful email/phone and address discovery engine that enables Nimble users to build outbound prospects’. According to Jon, prospector draws upon dozens of sources (not LinkedIn, so much he volunteered) to deliver contact information based on a company or domain name. Nimble also introduced an Add-In for Outlook on Android and, not surprisingly, support for Microsoft's Edge browser. Nimble also continues to pursue the strategy of embedding Microsoft products into the solution for efficient development of enterprise features as well as enabling channel partners to generate additional revenues. Addressing the Nimble Prospector first I, I must say that I really love the idea of it. And, judging by what Jon showed me, it is an exciting tool that can make life for salespeople a lot easier. Fellow analyst Rich Bohn – President and Chief CRM Analyst, Sell More Now, LLC is right when saying that “Too many CRM solutions still make the poor users do all of the work. This needs to end! These people are already way over worked. Thankfully, Nimble has been bucking this trend for a while. Nimble already does the best job of automatically finding your contact's social connections. Now, with the launch of Nimble Prospector, the program unearths even more valuable information about your contacts and automatically adds it to your contact record. Of course, my favorite is the email address that I need to have a genuine dialog with my contacts. Now, instead of searching my brains out, Nimble just finds the email address for me." But, having been offered a test ride, I also have a challenge with it as, being a browser plugin, it seems to work only if pop-up- and ad blockers are disabled. I think this is a high price to pay, unless it is sufficient to only whitelist nimble.com and app.nimble.com. All this shows that Nimble continues to pursue its "Trojan Horse" strategy to become the premier choice of ‘CRM’ system for SMBs. I have written about this earlier, most recently here. Apart from continuing on its path of simplicity and usefulness, Nimble strives to achieve this objective by becoming ubiquitous on the infrastructure and software stack that is very likely to become the premier business platform: Microsoft. Nimble’s close partnership with Microsoft helps to integrate the company deeply in the Microsoft partner ecosystem. As evidenced by the partnership with NeoCloud and by Microsoft’s decision to bring Nimble into its Accelerator program for late stage startups, Nimble’s deep integration with Microsoft’s tools makes it a natural choice for Microsoft Dynamics users. The next logical step after having embedded Dynamics, is to create a ‘Dynamics version of Nimble’ that is basically the entry point to Microsoft Dynamics business applications, offering a clear growth path from (SMB) Nimble to (Enterprise) Dynamics. On a side note, the partnership with Circleback is interesting. Circleback so far seems to have focused on Salesforce. In this case, Circleback’s partnership with Nimble – and by extension with Microsoft – could be considered a message about the growing strength of Microsoft’s ecosystem of business applications. Jon Ferrara is repeating the strategy he pursued with Goldmine. He is betting on the Microsoft infrastructure becoming the dominant business fabric, surpassing AWS while keeping Google at bay. Deep integration with Microsoft enterprise applications and tools creates incentives for the channel to co-sell Nimble in order to sell more first party software. In combination with an easy-to-use contact manager and social sales tool that benefits Office 365 users, this strategy can rapidly build broad distribution. Getting selected into Microsoft's Accelerator program gives quite an additional boost, because Nimble can tap into Microsoft's vast technical and business resources, building broader access to its partner and customer bases. The deep integration into Microsoft’s go-to-market strategy and execution should be the biggest program benefits for Nimble. 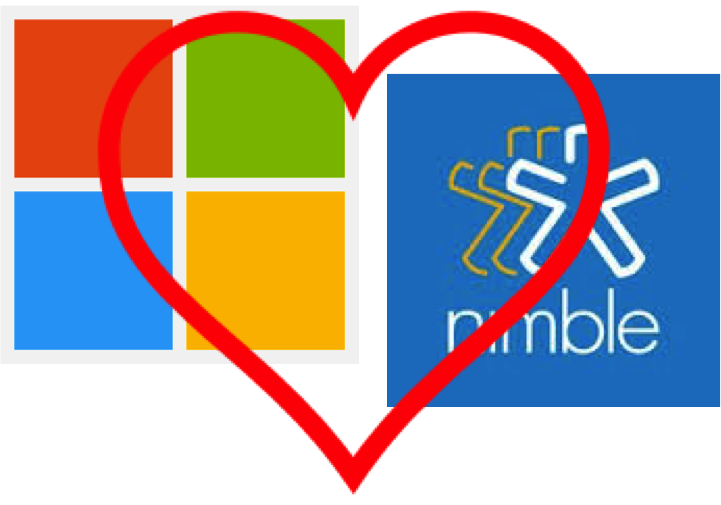 I have speculated earlier that Nimble is on course to be acquired by Microsoft. Now the company has taken another step closer to this possibility. And, Microsoft has opened the crucial door even wider into the S- end of the SMB market. The enterprise CRM market is largely saturated; the SMB market of companies with growth potential, which is still underserved, is where the opportunity lies. I would still label Nimble as a contact management solution rather than as a CRM but it is certainly a very valuable sales automation and intelligence tool that efficiently helps sales and marketing professionals acquire and nurture contacts. The system helps them to get over the hardest part of their job: getting the contact information and intelligence about the people they want to or need to contact with out spending a ton of time doing so. Having said this, if we were still using the term ‘Social CRM’ Nimble would be the archetype. With well beyond 100,000 users, the solution has traction. Business owners that heavily rely on Microsoft productivity tools and have the ambition to grow should certainly consider Nimble but should validate which customer service solutions inbound marketing tools to use integrated with it. Considering Microsoft is an ecosystem player, there should be some options.